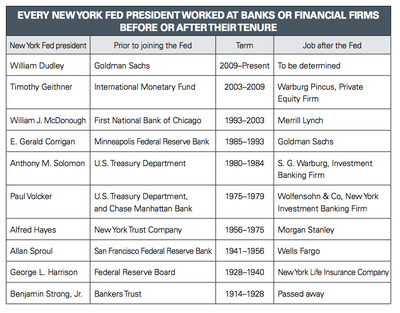 Every president in the history of the Federal Reserve Bank of New York has been a white male banker. A new report from the Fed Up coalition, an activist group calling for more inclusive economic policies, says the key regional Fed bank’s conflicts lead to subpar regulation of Wall Street. The Federal Reserve is supposed to be a public institution, yet every president of the Federal Reserve Bank of New York has worked for Wall Street before or after his tenure at the regional central bank. That’s just one of many apparent conflicts of interest that critics and community groups say have biased the New York Fed, which is especially influential in the Federal Reserve system, in favour of the very banks it is intended to supervise. A new report from the Fed Up coalition, led by the Center for Popular Democracy, a Washington-based nonprofit, shows just how stark the lack of diversity in race, gender, and professional backgrounds has been at the New York Fed. The report argues that this not only compromised the bank’s ability to be Wall Street’s cop – which is one of its central roles – in the run-up to the 2008 financial crisis but continues to do so today as the government is pursuing renewed financial deregulation initiatives. The propensity for intra-industry hiring trickles down the food chain. Of 514 New York Fed bank examiners hired from 2011 to 2016, a quarter came from financial-industry firms, the report found. At the same time, 48% of the 143 bank examiners who left the Fed from 2011 to 2016 went to work in the financial industry. 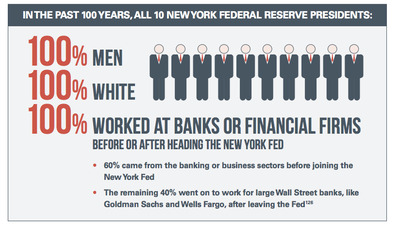 The New York Fed’s problems reflect a broader lack of diversity in the Federal Reserve system. Consider that Janet Yellen became the institution’s first female leader after more than 100 years, and the Atlanta Fed just last year appointed the first black president of any regional Fed bank. The report comes as the New York Fed is ramping up its search for a new president, with the former Goldman Sachs partner William Dudley set to retire this summer. Dudley has shown himself to be close in principle and practice to his former banking colleagues, supporting the view that the Fed is there to serve bankers rather than the public. The Fed’s regional bank structure, which makes the presidents of those banks unaccountable to the political process, can sometimes reinforce that perception. The New York Fed is particularly important in the regional Fed structure because its president is automatically vice chair of the policy-setting Federal Open Market Committee and is the only regional president whose vote on the committee is permanent rather than rotating. Under Dudley’s watch, a former Goldman Sachs banker narrowly avoided jail for obtaining confidential information from a friend at the New York Fed. There has also been a lot of talk about improving bank incentives and behaviour but little in the way of concrete action, particularly when it comes to executive pay. The very history of Dudley’s appointment is muddled with conflicts. Dudley was chosen to replace Timothy Geithner, who was becoming Treasury secretary, by the former head of the New York Fed’s board of directors, Stephen Friedman. Friedman was, simultaneously, the president of Goldman Sachs. Dudley started at the New York Fed in 2007, just as the credit crisis that would later morph into the worst financial crisis in generations – and threaten even the powerful Goldman Sachs – was getting under way. In 2009, Friedman abruptly stepped down from the New York Fed after it emerged that he was actively trading Goldman Sachs stock while he had inside knowledge of bailout negotiations taking place at the height of the financial crisis. So what’s an adequate solution to the problem? For Fed Up, change must begin at the top. Beyond that, Fed Up argues stricter enforcement of existing conflict-of-interest rules would already go a long way. At the same time, Fed Up said it was key to improve electronic tracking of bank examiners’ past and future employment to document the revolving door with Wall Street. 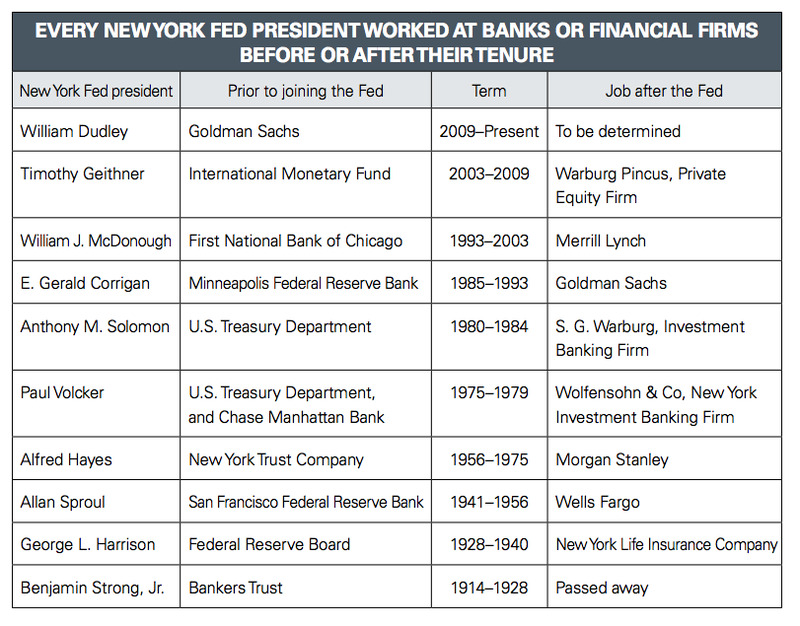 The New York Fed has its own database of past or future employers of any Fed employee who enters or leaves the bank, but 38% of New York Fed bank supervisors who left from 2011 to 2016 did not disclosure their future employer, Fed Up said.